In case you were wondering, we love to decorate for everything! The seasons are always welcoming because it is a change from what we have had. Whenever the change to autumn comes, it’s super welcoming because we’re leaving summer, and entering supposedly cooler temps (in Houston, that’s relative), but the seasonal colors are changing, we have Halloween, Thanksgiving, Christmas & New Year’s coming, and we can possibly start wearing boots, cute clothes & jackets (well, maybe not until November). Our decor designs are too cute to just use outside! Even though they are waterproof (they have survived a hurricane so I have proof), they are also super adorable inside as wall decor, door hangers, or a cool tree topper (for Christmas)! We’ve come up with some great designs for each season, so please take a look! 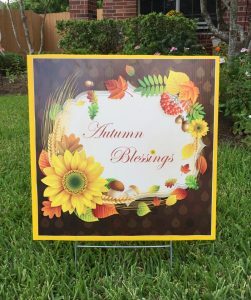 This beautiful “Autumn Blessings” signs is approximately 22 inches. 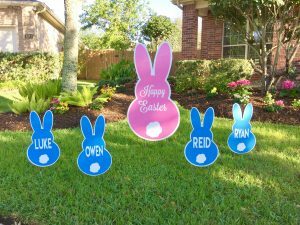 Of course, it is made from waterproof, outdoor sign materials, so no worries if it rains. The yellow border really makes the sign POP. $25. We love our big pumpkin! 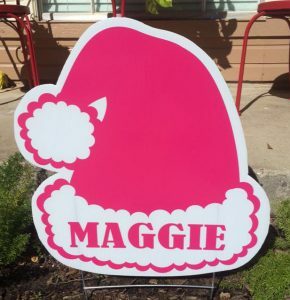 We will personalize with your name or phrase. 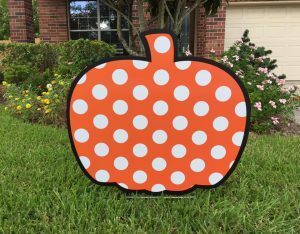 The black border helps make the pumpkin stand out in the yard. It is approximately 22″ wide. $30. We love, love, love Christmas! 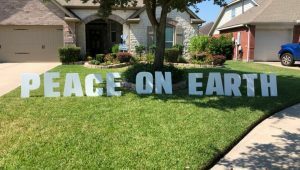 It is so much fun that so many people come together to decorate and make everyone smile. “MERRY CHRISTMAS” is a great solid red & white set with “CHRIST” in white so it stands out beautifully. 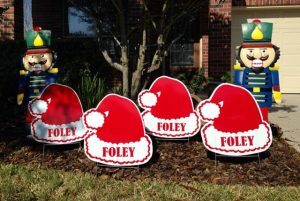 The “MERRY CHRISTMAS” set is also available in solid red. You could have a little DIY fun & embellish it with lights, polka dots, stripes, etc. if you wanted more than just solid. Chevron Set – Click to enlarge so you can see the pretty chevron & colors! Absolutely a beautiful sentiment all done in solid white! These letters are a huge 24″ tall! 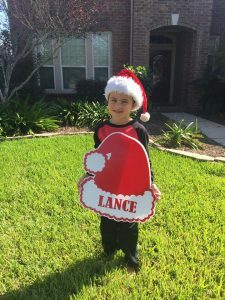 Isn’t Lance adorable showing off his personalized Santa hat?!! We have several colors available. If you want your family name, we can do that also! 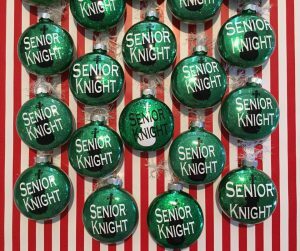 Personalized Christmas Ornaments! 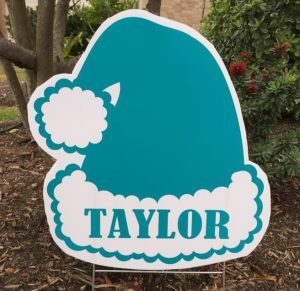 We can customize with your favorite colors, design & phrases, single sided or double sided.